Discussion in 'Feedback' started by Spoon Unit, Mar 13, 2016.
if you query on LCD you find nothing because LCD is too short? That perhaps ought to be tweaked in the forum software as LCD is actually quite pertinent, regardless of its shortness. mike01hu and Pierce like this. still seems to come up without a good pointer to what anything related to LCDs? Search for LCD not working and you don't find the post that's actually got that title. If we want people to stop using G+, this is crucial. Do you know of a thread specifically that has talk about LCD issues. Maybe this is the only thread relating to lcd issues. The only other place I saw people ask questions were the shoutbox. If we want people to stop using G+, this is crucial. Sorry the forum's not perfect. We're still trying to figure out what all's needed and sometimes you can't predict stuff like this till it happens. The default search just is kinda lack luster I'd need the gang to buy a new one. 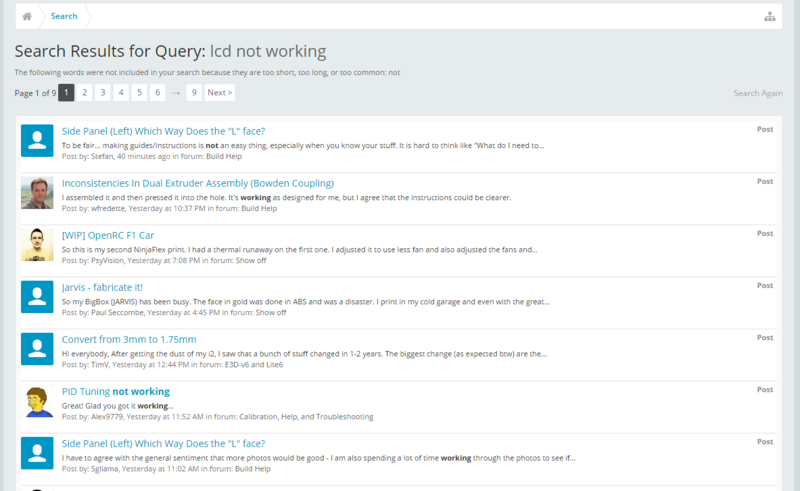 A 4 letter minimum search is pretty near standard in forum software. As Mike mentioned Google will index the site anyway soon so that's probably the best option. Don't apologise for the forum Mike. I wasn't having a go. I was just stating an issue and need. I'm not complaining about it, so please don't feel you have to defend it. Perhaps we could plug in a better search engine? I'm not clear on how to use the "site:" prefix to alter search. Are we talking about the search box here or directly on Google? Could you screen shot perhaps a search for "LCD not working" showing Google finding this post? MySQL's full-text search capability has few user-tunable parameters. You can exert more control over full-text searching behavior if you have a MySQL source distribution because some changes require source code modifications. See Section 2.11, “Installing MySQL from Source”. Full-text search is carefully tuned for the most effectiveness. Modifying the default behavior in most cases can actually decrease effectiveness. Do not alter the MySQL sources unless you know what you are doing. E3D is happy to stump up the cash to improve search if there is a plug-in that solves the issue. Having effective search is really important to making the forum a useful place to find help and solutions, so if it can be improved we'll do it.